The sponsorship of Canadian Studies in China emerged in an era when the Canadian government was involved in a wide-ranging effort to link Canadian and Chinese universities as part of a development program aimed at upgrading China’s human resources to meet the challenges of an open globalized economy. Canadian studies emerged alongside these university linkages as part of development assistance and helped to rebrand Canada as a model of academic excellence. 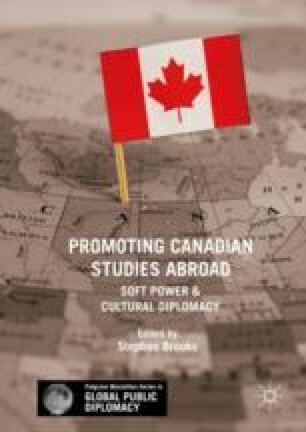 Canadian studies in China was also seen as an aspect of Canada’s cultural diplomacy and a factor in maintaining Canada’s image as a model from which other countries could learn. Canadian studies in China survived the loss of significant funding in 2012, and remains a thriving academic subfield with participating institutions across China. Canada-China Scholars Exchange Program. n.d. http://www.scholarships-bourses.gc.ca/scholarships-bourses/can/ccsep-peucc.aspx?lang=eng. Accessed 26 Feb 2018. Institute of Rural Development, Yunnan Agricultural University. 2017. News: “17th Canadian Studies Association of China Conference Opens at Yunnan Agricultural University”, December 31. http://inrd.ynau.edu.cn/index.aspx?lanmuid=87&sublanmuid=725&id=2004. Accessed 28 Jan 2018. Meisel, John, and John Graham. 2012. It’s Hard to Understand Canadian Studies Cuts. The Globe and Mail, June 12. https://www.theglobeandmail.com/opinion/its-hard-to-understand-canadian-studies-cuts/article4408869/. Accessed 26 Feb 2018. Xi Jinping. 2017. Secure a Decisive Victory in Building a Moderately Prosperous Society in All Respects and Strive for the Great Success of Socialism with Chinese Characteristics for a New Era, Full Text of Xi Jinping’s Report at 19th CPC National Congress. http://www.chinadaily.com.cn/china/19thcpcnationalcongress/2017-11/04/content_34115212.htm. Accessed 22 Jan 2018. Zhongguo Zhiwang. n.d. http://www.cnki.net/. Accessed 26 Feb 2018.